Yesterday was a really full and fun day. In the morning we traveled south for Bethany’s hair and make up trial and then to Brookline in the afternoon for the reception dinner tasting at the wedding venue, which is a gorgeous estate house. I was so happy to finally get the chance to walk around and see the place in person. There were lots of trees surrounding the main house, and the whole time I was imagining them all covered in the warm colors of fall foliage. Hopefully, mother nature will oblige and the leaves will be turning by October. 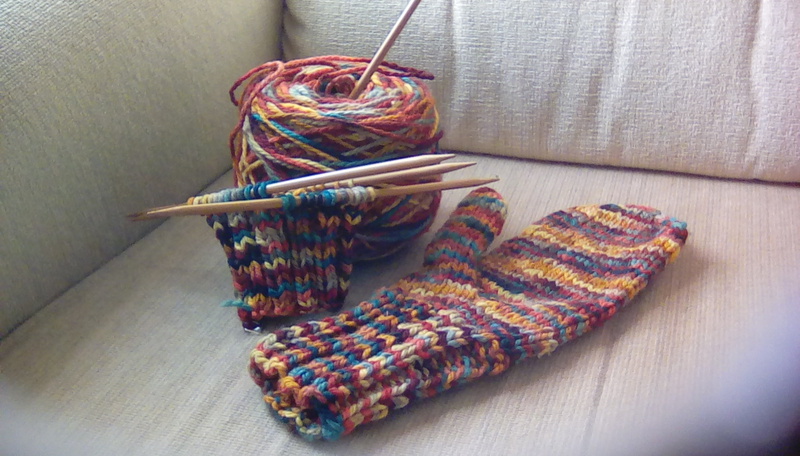 There’s been plenty of knitting progress, too. Mostly small projects that I’ve been able to stuff into my purse on the go. 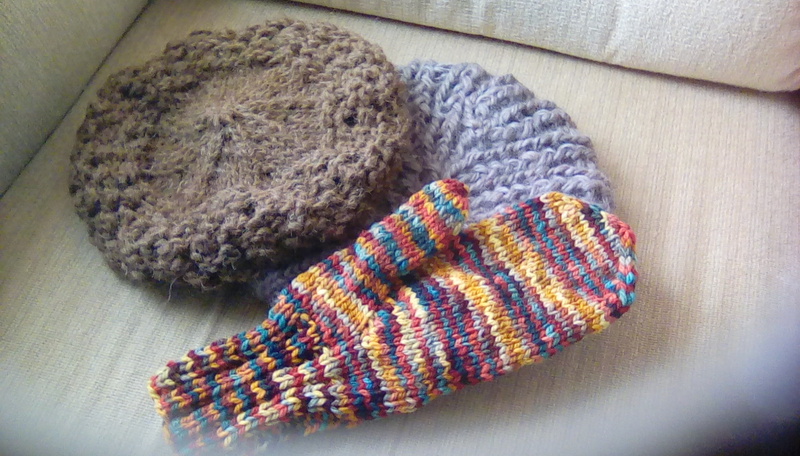 Over the past few days I have finished one of two mittens and two berets. Not too shabby. Left to right: Fisherman’s Wife Beret with unknown bulky weight brown wool yarn from yarn swap, Painted Sky Beret with gray handspun Romney wool yarn from Laban Sheep Farm, and Handful of Berries Mittens with Mosaic Moon Rambouillet wool yarn, “Vincent and the Doctor” colorway. Still need to block everything. Now I’d like to share a very special project with you that I worked on before my trip. A knitter friend of mine, Abby, sent me an email last month about a sweater crisis. Naiomi, a new friend that she had met at church, needed a sweater altered. She wanted to know if I could take a look at it? The sweater is a special heirloom, handknit by Naiomi’s mother before she passed away last fall. She sent me pictures of it. It is gorgeous, colorful, and unique. Extremely special. But there was one big problem. The sleeves were ginormous. They needed to be about half a foot shorter. Unfortunately, Naiomi had approached other knitters in the past about getting the sleeves altered, but they all took one look and told her it was impossible to fix it. So, the sweater remained unwearable since Naiomi’s mother lovingly gifted it to her. Why impossible? Because the sleeves had been knit sideways, which meant that you couldn’t just unravel the sleeve from the cuff. To actually unravel the sleeve, you would have to take a good amount of the sweater apart and reknit a lot of it. Not only would that be a lot of work for an alteration, but that would mean frogging (unraveling) her mother’s own loving handiwork. And that absolutely just didn’t seem right. After hearing a few other knitter friends’ suggestions, I decided to take on the challenging project. I had a plan. And here’s what I did. First, I cut off the excess length of both sleeves. Then, I unraveled some of the cut pieces so that I would have yarn to knit the edges with. As I mentioned before, the sleeves were knit sideways. That means I was left with a bunch of short sections of yarn instead of one long strand. To solve that problem, I spliced the pieces together one at a time by hand. How I spliced the yarn: I spread the plied ends of the yarn sections apart, wet them, and then I rubbed the overlapping yarn ends between my palms. This particular yarn spliced super easily. I only had to rub the ends between my hands for about 30 seconds. The next step was serging the raw edges of the sleeves. Then, I picked up the stitches and knit an I-cord bind off. For the finishing touch, I crocheted a button loop and sewed on a button that Naiomi had picked out from my collection of buttons. As a surprise for Naomi, I also sewed fingerless mitts with the leftover cuff sections that I didn’t unravel. Here she is trying on her newly altered sweater for the first time last Friday. To me, that’s full payment and reward for a job well done. Such a carefully thought out and beautifully crafted solution!